Double glazed uPVC windows have a superior form of insulation that limits 60% of the heat loss and gain in buildings. People living in hot climates are not much aware of its incredible uses as this revolutionary technological units were initially introduced in colder parts of the globe. So, uPVC double glazed windows are simply incredible for hot climate regions and here it is why. A double glazed uPVC unit has two parallel panes with a layer of inert gas in between, which is a great trick to establish a barrier among the outside and the building’s interior. It makes it thermally efficient and better insulated from external hot and cold air when compared to single-pane window units. A windows ability to conduct heat is measured in U-value and uPVC double glazed windows have a U-value less than half which means its ability to conduct heat is quite low. Areas that are massively exposed to sunlight and sunrays, the use uPVC double glazed windows can remarkably protect residents from greenhouse emissions. 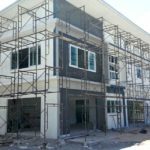 Many new homebuilders have discovered the fact that it is possible to fully cut down air conditioning in many sub-tropical or moderate environs, and substantially reduce the use of air conditioner in hot or very hot climatic areas. SO OPT FOR THE BEST WINDOW UNITS, BE SAGE AND SAVE BIG!